The beauty of the solitary, often snow-capped, stratovolcano, known around the world as Mount Fuji, rising above villages and tree-fringed sea and lakes has long been the object of pilgrimages and inspired artists and poets. The inscribed property consists of 25 sites which reflect the essence of Fujisan’s sacred and artistic landscape. 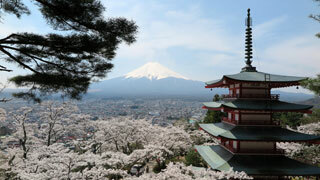 In the 12th century, Fujisan became the centre of training for ascetic Buddhism, which included Shinto elements. On the upper 1,500-metre tier of the 3,776m mountain, pilgrim routes and crater shrines have been inscribed alongside sites around the base of the mountain including Sengen-jinja shrines, Oshi lodging houses, and natural volcanic features such as lava tree moulds, lakes, springs and waterfalls, which are revered as sacred. Its representation in Japanese art goes back to the 11th century, but 19th century woodblock prints of views, including those from sand beaches with pine tree groves have made Fujisan an internationally recognized icon of Japan and have had a deep impact on the development of Western art. This article uses material from UNESCO World Heritage List article "Mount Fuji", which is released under the Creative Commons Attribution-Share-Alike 3.0 IGO License.